Love My Hairitage: How Much Reality Can We Tolerate When it Comes to Beauty? You Decide? How Much Reality Can We Tolerate When it Comes to Beauty? You Decide? This is What 170 Pound Weight Loss Looks Like. Brooke Birmingham is an Illinois-based blogger who over the course of four years, lost over 170 pounds. 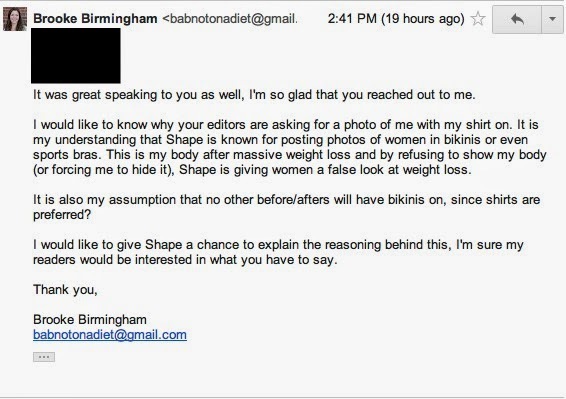 Shape magazine happened to notice one of her blogs and a representative reached out to Brooke about doing a "success story" profile to be featured on Shape.com. Birmingham agreed, and provided this photo to be used in the feature. After a few more emails in which the writer repeatedly cited an "editorial policy" against bikini photos, Brooke decided not to be included in the feature. Recently, Brooke appeared on The Today Show together with Shape editor-at-large Bahar Takhtehchian to discuss the unfortunate chain of events. Takhtehchian, for her part, stuck with the magazine's official story, claiming the incident was simply the result of a "miscommunication with a freelancer who is not employed by Shape. 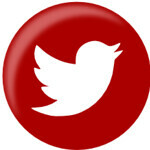 Unfortunately," she added, "[the writer] said that there was an editorial policy that simply doesn't exist. So, that's where things went awry a little bit." Ya think? Takhtehchian went on to say that the magazine is turning over a new leaf, "celebrating people like Brooke" by "featuring five other real women inside the pages of Shape magazine. And, yes, they will be publishing that bikini photo. Women who have gone through an extreme weight loss are impacted not only physically, but also mentally. I wonder how Shape’s initial response to Brooke, influenced her self-esteem? By agreeing to show photos of “real” women in their magazine, Shape seems to have taken a step forward. However, "real" seems to be a loaded term; it suggests that there's something fundamentally different about "people like Brooke," something that makes Shape featuring them not just its regularly scheduled programming, but some kind of generosity or charity. A “special edition” of sorts. What do you think? Would you intentionally buy a magazine with the above photo of Brooke on the cover or as a feature? What if that woman in the magazine were you?